We here at the OCNA blog have been familiar with TravelFleas.com since shortly after their launch in July, 2012 (more on that later). Since this blog is only a few months old, we finally got around to conducting an interview with John from TravelFleas (both on the phone, and via email). 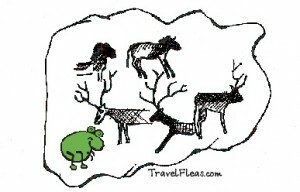 And we are happy to announce that this Blog has a $10 TravelFleas.com gift certificate to give away! This contest will run for 14 days, including the day of this blog post. See the very bottom of this post to enter. OCNA Blog: What are TravelFleas tags and how do you use them? 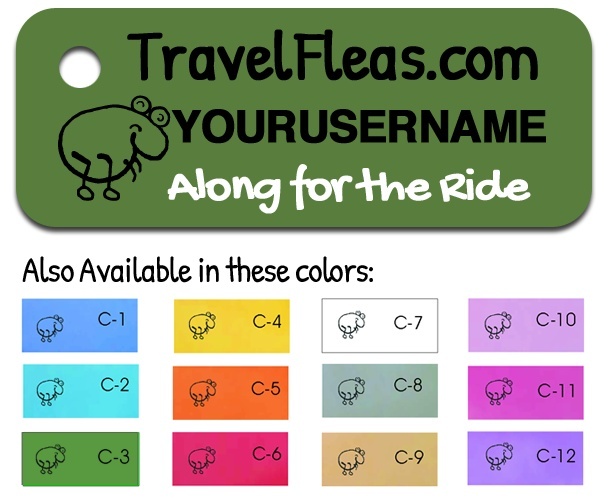 John: TravelFleas tags are affordable small metal tags, personalized with your geocaching username that you either attach to a trackable to go “Along for the Ride” (they are not trackables themselves) or leave in a geocache as a signature item. 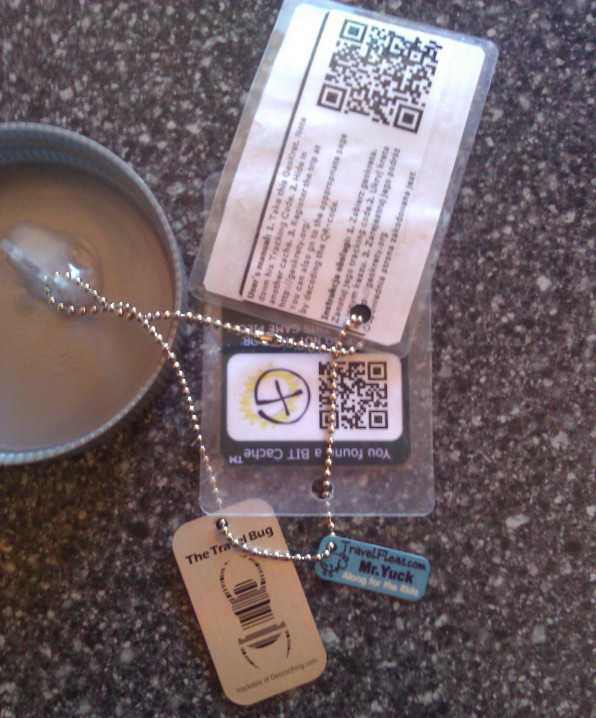 TravelFleas tags are durable and will stand the test of time out in the elements of the geocaching world. The reason for the personalization is to let other geocachers know you are a part of the game. 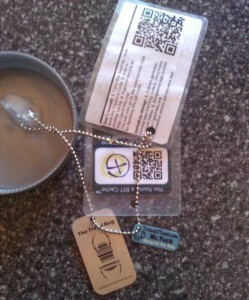 OCNA Blog: Do you allow something other than a geocaching username on your TravelFleas tags? 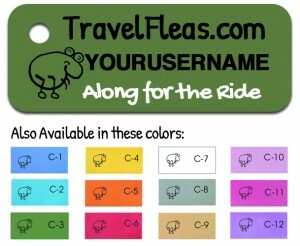 John: Our TravelFleas tags accept up to 20 characters. If you want to put the name of your scout troop, geocaching club, flash mob, etc, anything you want as long as it does not exceed 20 characters. OCNA Blog: How many people are behind TravelFleas? John: This group of four motivated geocachers had a lighting bolt idea, and off they went. OCNA Blog: How did your company come up with the idea for the TravelFleas themselves? John: We were geocaching, picking up trackables, and noticing that personalization was either missing, or misguided. What really hit home was when we saw a trackable with a picture of a little girl attached. While geocachers are a really nice group of people, this is something that is still in the public eye, and could be tracked back to the originator. 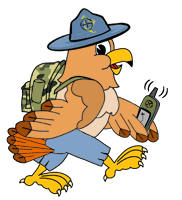 We felt a good safe thing to do would be to have your geocaching username attached to trackables. We got together one night, and through a lot of fun discussion, decided a “TravelFlea” should go on a trackable. OCNA Blog: I personally discovered your product within weeks of your July, 2012 launch when you followed me on Twitter, and I followed back. I have not noticed any other Geocaching product hit the social media as hard as Travelfleas (Facebook, Twitter, Flikr and Pinterest). Do you feel this is important, and have you gotten good results from it? John: We have found it is very important to get our name out there through social media. Social media is the modern form of advertising. Twitter has proven over and over to be the best advertising medium so far. I have been able to track a number of sales directly related to twitter follows and conversations. OCNA Blog: You recently had a tent at GeoWoodstock in Florida, and have told me you were very happy with the results. Was that the first MEGA event in which you did this? Do you plan to attend more? John: Last October we attended the Florida Finders Fest. We will attend more MEGA events, and will post to social media every time we plan on going to an event. OCNA Blog: Who is the artist behind all those TravelFleas Anthology cartoons that you regularly post to social media? Note: readers can view them all on this page on Pinterest.com. John: The anthology cartoons were developed as another way to express TravelFleas enjoyment of the geocaching world through an artist’s eye. We work together as a team to create and draw each cartoon. OCNA Blog: In addition to the tags themselves, you also sell personalized Travelfleas license plates, and Travelfleas logbooks logbooks for logging the progress of your travelfleas. I’m sure you can’t talk specifics, but will we see more product offerings from TravelFleas.com in the future? John: The necklaces we sold at GeoWoodstock were a hit. We value input from our customers. Ideas, comments and suggestions are always welcome though our web site or social media pages. We have more products coming in the future. You will have to check our web site often for updates. OCNA Blog: I assume most of your orders come from the USA and Canada. Have you received orders from elsewhere in the world? John: Along with The US and Canada, we have gotten a number of orders from the UK. We have also gotten orders from New Zealand, Australia, and Finland. OCNA Blog: Where have TravelFleas been spotted? John: Along with the countries we have sold TravelFleas tags to, spottings have occurred in Germany and France. Great interview, thanks to John for that! Visit them at TravelFleas.com. And be sure to follow them on Twitter, Facebook, Pinterest and Flikr! As you can see, the blogger has some TravelFleas! Here is one attached to an OpenCaching North America Moving Cache (yes, we still gleefully accept that cache type). And of course he choose color C-2, the “OpenCaching color”. You can order all one color, like I did, or in 12 packs, with one of each available color. Now for the contest! Where you can win a $10 Gift Certificate to TravelFleas.com, a contest that will begin with the publication of this blog post, and end on July 10th, 2013. Or alternatively, if you can’t wait, go to their website, and order some now! To enter, fill out the form below with your name (as it says, “Geonick” is fine), and a valid email address. We will never use your email address, and the Google Document storing all the entries will be deleted after the contest. There are rules, of course, which appear below, in italicized text above the entry form. Rules: To enter, provide your name and email address in the form below. One entry per person, and one entry per email address. There are no Geographical restrictions, contest is open to anyone in the world. The contest begins upon publication of this blog post on Thursday, June 27th, 2013, and ends at 7:00 PM Eastern Standard Time on July 10th, 2013. One winner will be chosen at random from the entries received. Winner will be notified via email, notification being sent from the email address opencachingnorthamerica at gmail.com (be sure to check your spam folders! ), and must respond within 48 hours, or the prize will be forfeited, and another winner will be chosen. Once accepted, the prize will be delivered via email. EDIT: Contest over, entry form removed. Thanks to all that entered! Super, great, fantastic, awesome contest! We submitted our entry!! Great post! Good luck to whomever wins!